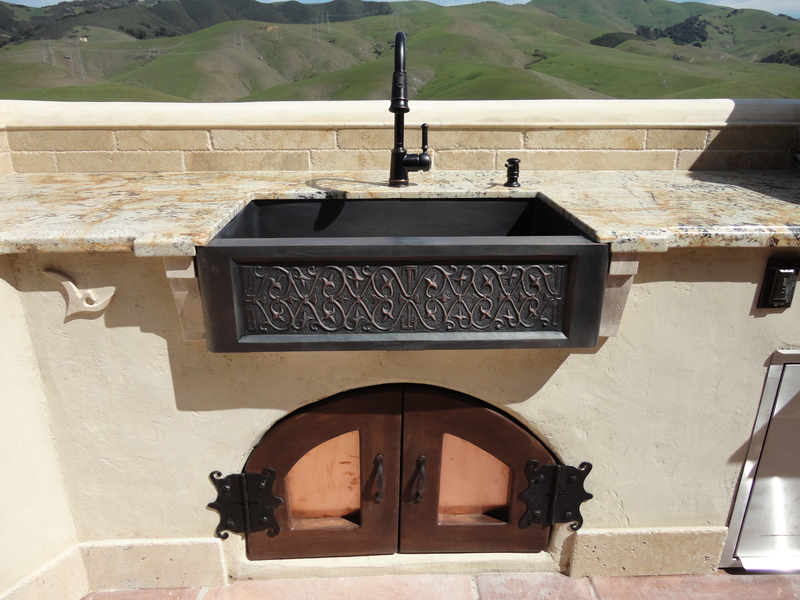 Tuscan Themed Outdoor Kitchen w/ Earth Stone Pizza Oven and Fire Pit w/ Water Feature » 30″ Bronze Farm Sink with custom Cypress Doors with copper inlay, and custom hinges. Along side of the farm sink are hand carved travertine corbels and LC logo to match the travertine mantel and hood assembly. The doors where made out of Cypress with copper panels and custom powder coated hinges. This entry was posted on Thursday, May 30th, 2013 at 5:57 pm. It is filed under . You can follow any responses to this entry through the RSS 2.0 feed. You can leave a response or trackback from your own site.